Official runner-up in the presidential elections, Heritage party leader Raffi Hovannisian has resumed his visits to the provinces of Armenia, this time meeting and greeting the residents of Dilijan, Ijevan, Noyemberyan and Berd and congratulating people on their “victory”. People who had come to the rally complained to Hovannisian that hours before his arrival the police had tried to disperse the crowd. Heritage member Styopa Safaryan said in Dilijan: “The authorities continue disseminating fear among people and before our arrival tried to properly clear the area of people”. 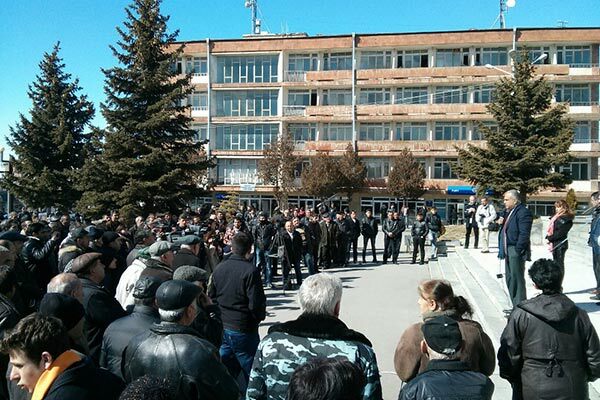 During the Ijevan rally, the police was periodically saying with a loudspeaker that the meeting was illegal and the participants would be brought to administrative liability. Hovannisian immediately called chief of police Vladimir Gasparyan and said he had come to greet people. “Know that there isn't a more law-abiding citizen than me, and if I have violated the law, please, hold me administratively liable,” he told the chief of police and immediately started his meeting. In Ijevan where Hovannisian won by 61 percent of votes, Hovannisian said he is not planning to take back the power, but to constitutionally return it to people. In Noyemberyan the rally participants were videotaped by police, but people were fearless. The Heritage party leader said in Noyemberyan that they have won, and now all they have to do is consolidate their victory. “The incumbent president must resign, Syunik governor and those of other provinces, too, since from now on they will be elected in accordance with the RA Constitution,” said Hovannisian in Noyemberyan where he won by 52 percent of votes versus President Serzh Sargsyan’s 40. “Noyemberyan has no fear of the one-party-led state”. In Berd, one of the women in the crowd suggested that Hovannisian goes for an open confrontation for one day and achieves change of power even if at the cost of bloodshed. The Heritage leader responded to this that he would never allow bloodshed, because it already happened once – on March 1 (2008). Despite poor weather conditions, from Berd Hovannisian moved to Chambarak and then to Talin, Artik, then Vanadzor, Gyumri, Spitak and Aparan. Hovannisian will resume public rallies in Yerevan on March 8.